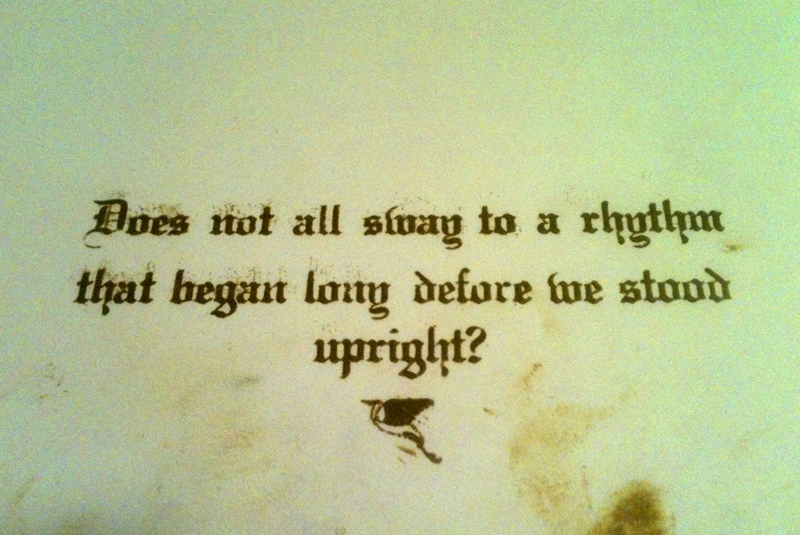 Does not all sway to a rhythm that began long before we stood upright? We are in the mountains home, just guests. Guests of the sky, the streams, the giving soil we nurse from. Wednesday morning at 3:55am (Pacific time) is a total lunar eclipse, the second eclipse of a tetrad. The full moon is rising now as I write this, a large moon near perigee. It has been a longtime mindfulness practice of mine to be aware of the movements of the moon, planets and stars as much as possible. This has turned into a lifelong love of astronomy and, as of last year, I have been making a calendar to help keep track of it all. In order to distribute the calendar for 2015, I have also been involved with the local Independent Publishing Resource Center (IPRC), taking letterpress classes and such. The IPRC is an amazing warehouse full of fun tools, a zine library (they say it’s the world’s largest) and really lovely people. Hopefully I will gain the resources to get the calendar produced in time before the new year. There is a peace that comes over me in autumn, knowing that winter slows us down and grounds us. The farm across the street cut their corn this week. Squash and hazelnuts line the kitchen counter. The squirrels and crows are frantically running with nuts. I hear the crows drop them from the power lines every time I walk down to catch the bus, trying to crack them open. Each night the swan, the eagle and Pegasus rise higher in the sky, flying over the treetops, chasing the sun. Now the full moon rises, chasing the sun so close it will be caught in our shadow at dawn. Spence here: I knew Billy saw and heard the squirrels and crows dropping the nuts on the pavement! That is one of the myriad subtleties I love about Billy. There is truth that goes unsaid between us, only because it needn’t announcement, yet, like love, all feelings and events are there. Some say like faith. The moon rising tonight is very large. I appreciate the light and reflection through the tall cedar and spruce, entering our new, little, east-facing shack. As early as tomorrow we will “move in”. We’ll view the lunar eclipse and wish well, another amazing Autumn. We purchased a new futon this week and I’m excited to get cozy. We have much more to do, but since Billy finished the back wall on the inside, we will be able to complete the remaining tasks while inhabiting the place. The inside smells like cedar. We are looking online each day for fun free finds–more wood for the side walls, an armoire, a tall dresser and maybe a trunk and some nice rugs to tie it all together. There has been a lot of support in raising this abode. I appreciate the patience of our friends, who wait not in vain, for our eventual birth from work and building. I kidded the other day about sending a post card to Southeast Portland, (we live in Northeast), since I never make it out of my neighborhood. I haven’t even talked to my parents in weeks! It will be nice to make this transition and have some more time for cooking, drawing, reading, correspondence and painting. Autumn sometimes lulls me or depresses me with nostalgia. Also, sometimes it can make me anxious, as I remember the growing fear of cold, dark mornings before grade school, waiting for the bus. Waiting for the alarm to go off. Falling back. The end of summer. Sad that I equate the smell of Autumn with that fear of youth, but I have other good memories of it as well–cider mills, donuts, crunching leaves on forest walks with my family. Hot afternoons, where the tress glow orange and red and my mind drifts to more romantic ideas of life. Life how it can be, sweet and ready for harvest. Still, Fall is my favorite season. I wrote this poem, which I turned into a song, exactly one year ago, when we were living on our friends’ land in New Mexico. I hope it conveys a sense of Autumn for you all. This entry was posted in Astronomy, Salvage Building, Writing. Bookmark the permalink.